What is an ozone sauna? Ozone saunas are saunas that also apply ozone gas to the skin for additional benefits. These can be wet or dry heat saunas. In Ozone Therapy, the ozone sauna falls under the umbrella of “transdermal ozone” along with cupping, bagging, etc. Why should you try an ozone sauna? By combining ozone and hyperthermia (heat), you get to enjoy the benefits of both in half the time! The intention of whole body hyperthermia is to raise the core body temperature to induce an artificial fever. Higher temperatures enhance all bodily processes, including the activity of hormones, enzymes, protein signalers and neurotransmitters. Hyperthermia puts the body in an optimal state in which to receive other therapies, such as ozone. There are two main types of ozone saunas: (1) dry ozone saunas and (2) ozone steam saunas. These ozone saunas rely solely on the Far Infrared heaters to increase the temperature inside the chamber. The ozone breaks down in the chamber due to the heat and mixes with your sweat, forming ozone products which you then absorb through your skin. You get wooden box-style Far Infrared saunas and portable dome-style Far Infrared saunas that you can lie in horizontally. Pros: Along with all the benefits of ozone and hyperthermia, you can also enjoy the numerous benefits of Far Infrared therapy! Far Infrared Rays (FIR) penetrate deeply into the skin and subcutaneous tissue, relieving joint and muscle aches and pains, energizing the body and promoting the chelation of heavy metals, just to name a few. Cons: Sometimes you need to purchase the ozone generator separately, or it is included at an extra cost. Did we already mention that the ozone mixes with your own sweat? Yeah, ew. Ozone steam saunas use a steam generator to increase the temperature by filling the sauna with steam. The ozone breaks down and mixes with the steam to form the ozone products that your skin absorbs. You get ozone steam sauna tents, or more luxurious and durable cabinets made of hard plastics or fiberglass. Pros: The ozone steam sauna is perhaps the most powerful way to simultaneously oxygenate and detoxify the body. The steam allows more of the oxygen and ozone products to penetrate your skin. It also makes it easier for your skin to excrete toxins when you sweat. Cons: There is no Far Infrared, so you miss out on all those benefits. Why settle for only one or the other? You don’t always have to choose between wet and dry. There is a third option: get an ozone sauna that can do both! Some ozone steam saunas also utilize Far Infrared technology, so you can enjoy the best of both worlds! 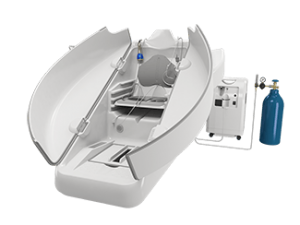 One such device is the HOCATT, a multi-modality ozone steam sauna that incorporates Far Infrared, Pure Oxygen Breathing, Frequency Specific Microcurrents, Essential Oil Infusions and more – all in one relaxing, 30-minute sauna experience.